Create a beautiful centerpiece of whole fruit and vegetables for the holidays. Try something different this year. Buy fruit and vegetables (or use your garden produce!) and turn them into a centerpiece. Fresh fruit and vegetables are beautiful and fragrant. Plus, they last much longer than flowers. After dinner, you can donate the entire centerpiece to a local food pantry. 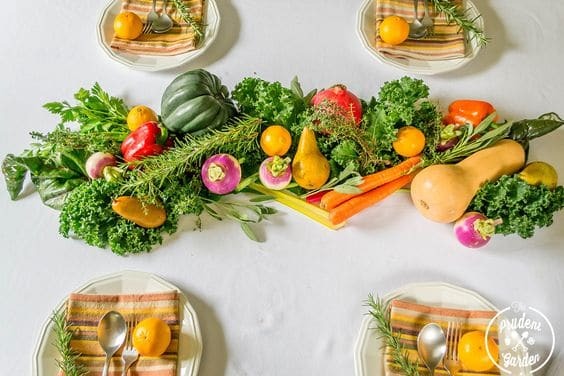 Turn your centerpiece into nutritious food for the less fortunate in your community. Get inspired with DIY instructions from The Prudent Garden. Think this is a good idea? Please consider making a tax deductible donation to AmpleHarvest.org so we can continue helping get fresh produce to the families that need it most. Every gift helps! We appreciate your support!